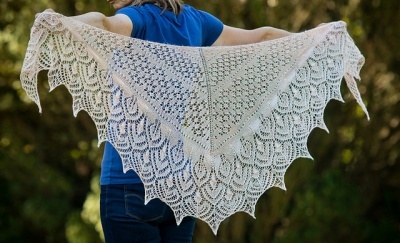 A beautiful design by Mary-Anne Mace, Summer Petals is a perfect shawl for the warmer weather. 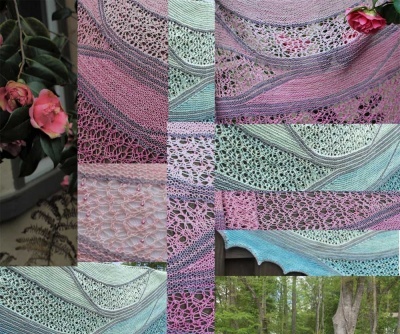 Make sure to get your pattern directly from Mary-Anne's Ravelry page. What we have here is yarn and beads for you. 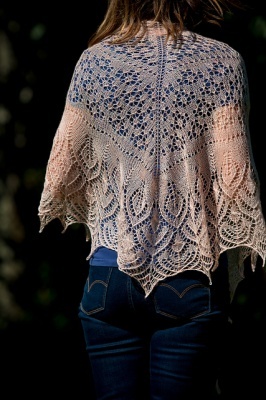 Summer Petals is a deep crescent shawl which evokes those easy, breezy days of summer we all hanker after. Sections of repeating lace motifs are edged with a deep border reminiscent of overlapping petals. The shawl shaping begins as a traditional triangle with edge and spine increases. The spine increases are discontinued when the deep border begins, creating the deep crescent effect. The end result is a versatile shawl, less deep than a traditional triangle, and with ends long enough to easily wrap about your shoulders. We offer different yarn than what Mary-Anne used in her oroginal. 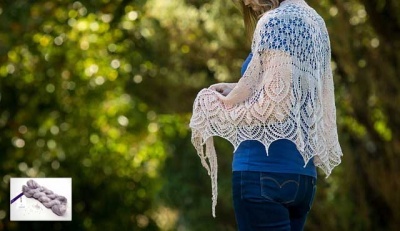 Basically to knit the shawl as shown, one needs about 590m (that translates to 645 yards) of lace weight yarn. 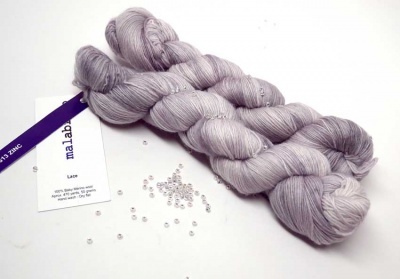 Our kits are made up of Malabrigo's "Lace", 100% baby merino wool, with 470 yards/ 50 grams. So two skeins will be in each kit giving you a total of about 940 yards, well more than is needed. We brought in a lovely colorway that will mirror to some degree Mary-Anne's original and allow all the gorgeous stitchwork to show up beautifully. Zinc is a tonal play on varying lighter grays, from pale to silver, with just the faintest suggestion of lilac to it. A few of the test knitters used beads in their shawls. We offer the option to get up to 20g of size 8/0 beads -- that's about 800 beads, plenty to put whereve you please. You will see that choice via the drop-down menu above. You will have to decide where and when to add them, of course, but there seem to be a lot of good places for them in the lace here. If you have a preference on color, let me know. Otherwise I will choose for you and most likely stay in the overall silver family. 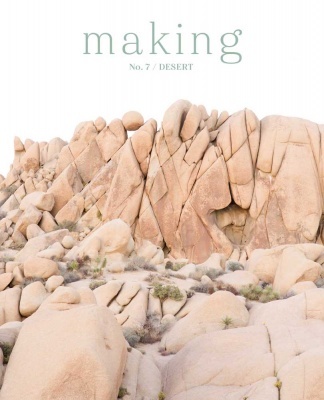 Remember to get your pattern directly from Mary-Anne's Ravelry page. Mary-Anne also writes, "There are multiple charts, and while at first they may seem quite large, I do this deliberately (rather than making additional, but smaller charts), because I think a chart that actually looks like the knitted fabric is easier to follow and understand."